We Care! We Dare! We Share! The last day of school is this Wednesday and we need your help! Mr. Crain is looking for volunteers to help pop popcorn starting at 8AM on Wednesday morning for one hour shifts. No experience required! He will be making a TON and needs all the help he can get! If you are available and would like to help out please contact Mr. Crain in person, by e-mail at BCrain@msd.k12.or.us or call the school office at 503.565.5400. The 2012-2013 school year is coming to a close in just a couple weeks. Everyone is excited and anxious to head off to summer break. To help us finish out the school year here is a list of upcoming events for you to enjoy. Come join us for the last classroom work party of the school year. As always, your help on these projects make a big difference for our students and our teachers. Thank You to everyone who has come to these work nights and to everyone who will join us next week. Spend an evening with friends and family celebrating another great year at Wascher! Snack food walk, carnival games, face painting, fortune teller, pocket lady, lollipop tree, candy guess, photo station, spin art and more! Hamburgers, Hot Dogs, Pizza, Chips, Bottle Water and Popcorn!! Cindy’s Gym Membership, Sherwood Ice Arena Passes, Enchanted Forest Passes, Bullwinkles Fun Center, OMSI Passes and many more fantastic items. We are looking forward to seeing everyone there! Please join us for the last PTA meeting for this year. We will be reviewing what the PTA has accomplished this year and talking about what we would like to work on for next year. We would love to have your input in helping us build a stronger PTA. The PTA would like to give our support to the Lafayette Liberty Kids Bike Parade for the 4th of July and that means that we need YOU! There are many fun jobs that need to be done the morning of the parade, such as handing out bubbles, helping to decorate bikes, handing out patriotic wand craft kits, serving lemonade and shortcake, just to name a few. If you are planning to be in town for the 4th and would like to help out please let us know by e-mailing info@wascherpta.org. 4th Annual Father Daughter Ball! The 4th Annual Father Daughter Ball is coming up on June 23rd. The Ball is organized and sponsored by local area churches and gives Dads and Grandpas an opportunity to take their daughters out for a night on the town. Tickets are only $10 for Dads and all Daughters get in free. For more information check out the flier below or contact the Lafayette Community Church at 503-864-8409. The goal was to raise $5,000 during the jog-a-thon this year. 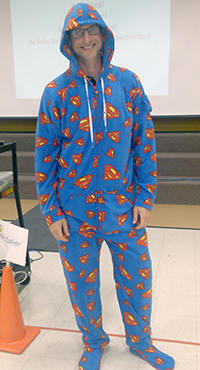 If the kids were able to meet the goal, Mr. Crain said he would dress up in Superman footie pajamas for a school assembly. Unfortunately, the kids came up $400 short….they were heartbroken. But Superman did not dissappoint, Truth, Justice, and the American way prevailed! He may not be THE Superman, but he’s OUR Superman! Story/photo by staff member Debbie Gooch. The Wascher PTA would like to say “Thank You” to all the fantastic teachers at Wascher that help our students achieve their fullest potential everyday. This week is Teacher Appreciation week and we would like to ask everyone to take a couple extra minutes, find a teacher and let them know how important they are in the lives of our young people. The time they commit on a daily basis to plan for their classes, investigate new ideas, instruct in and out of the classroom, share life lessons with and to simply care for each student helps mold and shape our children in extraordinary ways. To help celebrate this week the members of the PTA will be providing breakfast treats (like muffins, bagels, fruit) for the teacher on Tuesday, May 7th, and dessert type goodies (such as cookies, brownies, cupcakes) for lunch on Thursday, May 9th. If you are interested in helping in the celebration feel free to bring your treats to the school on either of those days. Lets plan to fill the teachers room full! 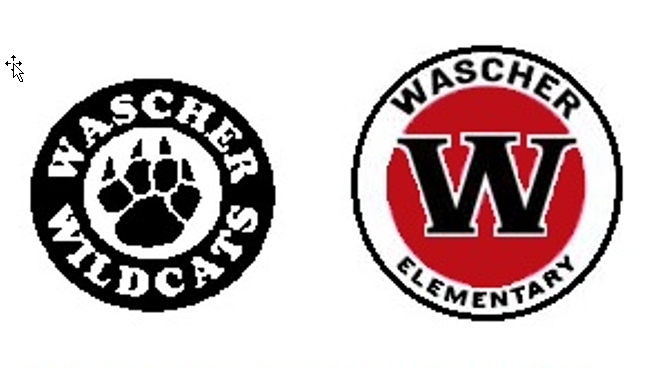 Order forms for this years Wascher Wildcat T-Shirts went home in Tuesday folders last week. There are two great designs to choose from this year, the returning Paw Print for last year and the all new “W” that you have seen around the school this year. You can choose T-Shirts, Hooded Sweatshirts, Beanie or Blankets. To add a personalized touch you can have your students name added to the back of the T-Shirts for only a little more. Remember to get your order back in before this Friday, May 3rd, to make sure you and your family are sporting the latest Wascher gear. Volunteer Appreciation and the Wildcat Roar! As volunteers we spend the hours helping others for just that reason, to help make a difference in the lives of our students, teachers and school community. We do not expect anything in return, we do not want a fuss to be made about us, we just want to give our time quietly and go home with the joy of knowing we accomplished something positive. However, once a year, as a Nation, we celebrate everyone who has given freely of themselves in an act of kindness and generosity towards others. Next week, April 22-26, is Volunteer Appreciation Week, and is the time that we get to celebrate you and everything that you bring into our community. Whether you volunteer on a weekly basis or have only helped out once all year we want to say Thank You! Each person who has given even the smallest amount of their time has done something fantastic for our students. To honor our amazing Wascher volunteers we would like to invite everyone to a special Volunteer Appreciation Dessert on Wednesday April 24th from 7:00-8:00 PM in the Wascher Library. We hope to see each and every on of you there. Just a reminder that the Jog-A-Thon will be this Friday, April 19, 2013. Wear comfortable shoes and bring a water bottle. Collection envelopes can be returned to school at ANY TIME but must be returned by Friday morning before the Jog-A-Thon to be included in the drawing for prizes. Don’t forget, we are trying to raise $5,000 to build a wood chip track at Wascher. Also, if we reach this goal Mr. Crain will wear footy pajamas for one whole day!! We are still looking for a few more volunteers to help out on the day of the Jog-A-Thon. If you are able to come and help count/verify the collection envelopes or would just like to help cheer and encourage the kids please let us know. You can contact us at info@wascherpta.org for more information or to tell us you will be there. Just a quick reminder that we will be having a Classroom Work Party tonight from 6PM – 8PM in the Community Room at Wascher. There will plenty of projects to work on that will benefit all Wascher students. We would appreciate any help you can provide, whether you can come for a half an hour or the whole two hours. Let us know you will be coming by joining our Facebook event by clicking here. Thanks in advance and we will see you tonight! Come and join us on Wednesday March 13th at 7PM for our March PTA meeting. We will be meeting in the Wascher Library and childcare will be provided. The PTA has sponsored some great events this past month including a Classroom Work Night, Panda Express Fundraiser and a Family Movie Night. We need your help in making these activities a great success! Come to the PTA meeting or contact us at info@wascherpta.org to find out how you can get involved!